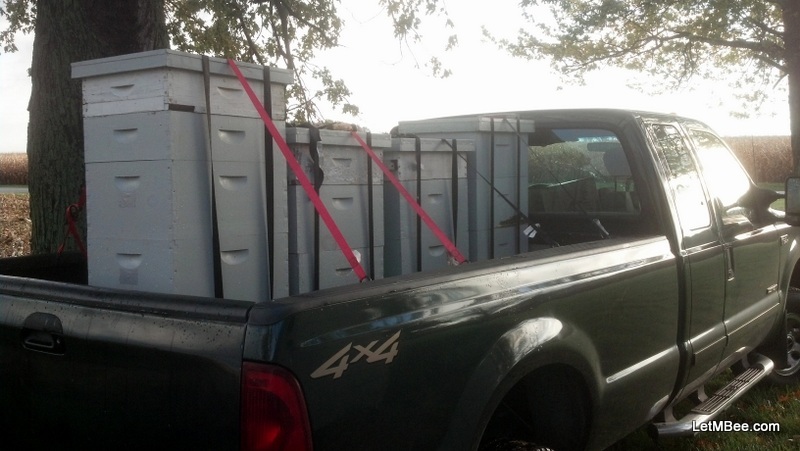 The 4 hives loaded in the back of the truck ready to move. Time has really flown this fall and I have missed the opportunity to tell you about some of the goings on around here. 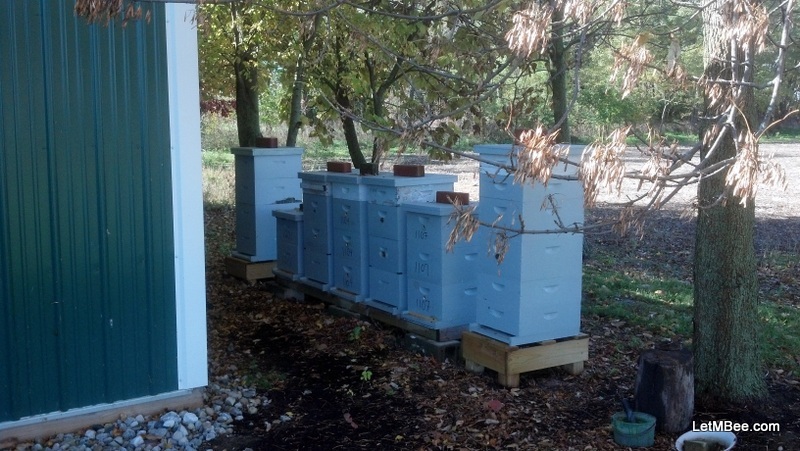 One of the stories that fell through the cracks was the moving of 4 hives a little over a month ago. They were moved as the first part of an experiment that will be conducted next spring. I am going to attempt to make several splits next year to see if it can improve my genetics. Much thanks to the free help. On a nice Thursday back in October these hives were loaded up and moved from my home apiary to one about 4 or 5 miles up the road. I had to recruit a friend to help. Three of the four were VERY heavy. I am not certain of their exact weight, but I know that we had trouble lifting them into the back of the truck. A hive moving tool was used. There was nearly a mishap when it was time to take 1101 out of the truck. This was a hive that did extremely well this year. In August two supers were removed. Two supers remained on this hive as well as several others because I only own 10 – 5 gallon honey buckets and couldn’t store all of my honey crop. My plan is to go back around to such hives in March and remove the remaining supers for extraction at that time. 1101 was VERY heavy and the center of gravity was pretty high. At my last inspection it was noted that the two supers were filled with capped honey as well as the top DEEP. We almost lost it removing it from the truck at the new hive site. There are now 7 hives at Hive Site 03. It is the highest hive density I have ever had. The plan from here is to go back in March or April and split hives based upon their condition. I will wait for the first swarm report in my area and then begin splitting. I am going NOT going to split the strongest of the hives, or the weakest. The splits will be made from the ones in the “middle” after the winter. All of 6 candidates for splitting are living in three deep boxes. I anticipate making strong two-way splits out of them. The resulting colonies will be moved to areas that have very strong hives already, OR places I know with high densities of feral bees living in trees. It is hoped that the newly formed queens will mate with drones from the strongest colonies and give me better genetics. 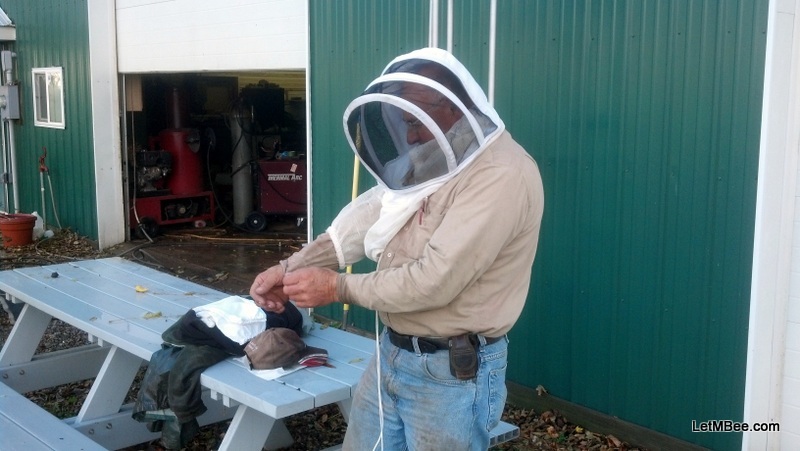 I have been conversing with a beekeeper from Northern Indiana who has been doing this for the last several years, reporting that his stocks have improved over time. I did not ask for permission to use his name so I am leaving it out. He has been featured in American Bee Journal in an article by Randy Oliver. Why do I mention this? If it is a creative strategy to increase the genetics of stocks I can’t take credit for it. It is this gentleman’s belief that drone genetics are not valued enough in beekeeping. I will get permission from him next spring when I revisit this apiary and make the splits. I know I have been put off from the idea of making splits in the past, but I am constantly evaluating my practices. If this does increase the strength of my stocks I view it as being worth the stress that causes. I am not going to do this with all of the colonies. As with all things beekeeping I will do a small scale trial, evaluate, then make a determination as to whether or not to continue. What do you think? Any predictions on what will happen? 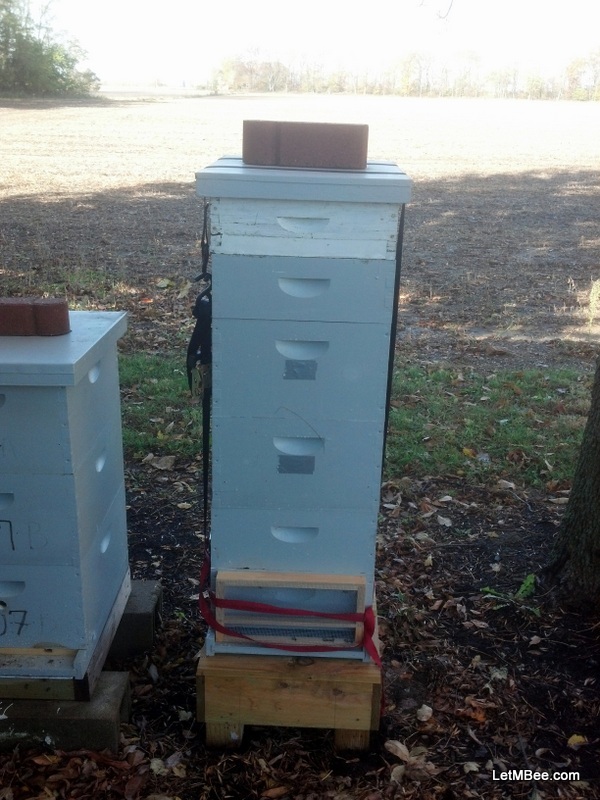 This entry was posted in Experiments, Feral Bees, Hive Reports, Posts, What's going on.. and tagged bee, bee genetics, genetic resistance, Indiana Beekeeping. Bookmark the permalink. Are you worried about African bees when you get wild bees? I live in Eastern Indiana. To my knowledge they are not here yet. Depending on where you live it could be a problem. According to what I have been able to read about swarm trapping Africanized honey bees prefer nest cavity volume of something like 13 liters. European honey bees supposedly prefer a cavity closer to 35 liters. By putting up a trap made from an old hive deep it is in the 30-35 liter range. I am TRYING to attract europeans, but I don’t think there are any around me. Do you live in an area where Africanized bees are found? I believe you are referring to SPLITS. The reason I have not revisited them is that I have moved away from using this procedure, focusing more on placing CatchBoxes and Swarm Traps to increase my bee population. This is the first year I have purposely enticed breeding hives to swarm with hopes of catching them. Overall this has been a success for me. At the time of writing this I have currently caught 29 swarms this season. Most of which are NOT from my apiaries, but I am fairly certain 10-12 of my catches have come from my own “breeding” hives. These are proven colonies, caught from Agricultural zones, that have survived for 2+ years without feeding or treating. Many of the breeding colonies were first caught in 2011 and 2012. The reason I have gotten away from splitting is all about TIME. Splitting can work OK, if you don’t have other things on your docket. With a work schedule that is as irregular as mine along with weather that never seems to want to cooperate it is just easier for me to allow them to split themselves at the appropriate time and then catch em. Now I know I will probably not catch them all, but I view that as being alright also. If I don’t catch all of them this year, or next year fine. Sooner or later the available cavities that are around my breeding yards will be OCCUPIED. This will help in creating a Feral Reserve of bees around my breeding yards. As this happens, not only will I be catching swarms that come from my hives, but also catching survivors that have been living a feral existence. With swarming, the glass is ALWAYS FULL. No matter whether I catch them initially or not. Also one common practice that is almost always advocated after splitting is feeding. In my beekeeping operation, if a method results in a NEED TO FEED, I look for alternative methods. Once I get caught up a little I will go more in-depth with how this process is working. I experimented a little with it last year and more this year. It is a “method in progress”. Thanks for reading, and commenting.